Adjustable arm chair comprised of rectilinear members. Square seat back attached by hinge to square seat notched on bottom, attached at midpoint of seat back and towards front of seat. Continuous arm rest, front leg, runner, and back leg that curves upward from back runner to front of arm rest. 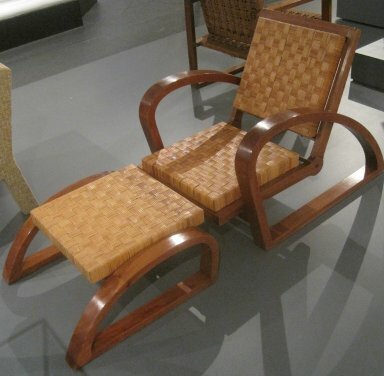 Squared seat back and seat of woven cane forming checkerboard pattern.